Risk management is the cornerstone of a sustainable trading plan. Yet it is always ignored by new traders who are only looking for the next fancy strategy. Furthermore, trading risks come in so many forms and can be challenging to manage even for seasoned traders. 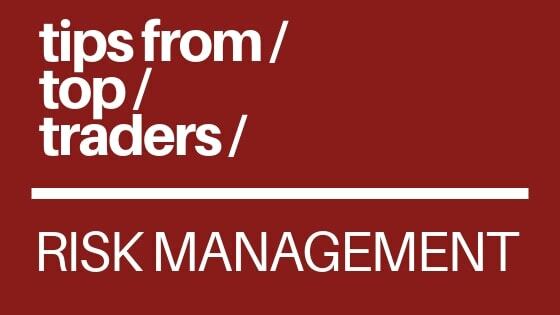 Hence, in this article, let’s take a close look at what seven top traders have to say on risk management. Trading quotes are well-liked because they are pieces of bite-sized advice that are easy to read. But to gain value from these timeless tips, you cannot just read and forget. To help you do this, for each trading quote below, I have included action items to help you to implement them in your trading. Losing trades are inevitable. Always decide how to respond beforehand. Dealing with losses is not something you can handle on the fly. Have an exit plan when your trade goes wrong. Consider a volatility stop-loss. Paul Tudor Jones did not fare that badly if you look at the trading setup in isolation. It was his outsized position that ruined him. He risked too much on a single trade and lost close to 70% of the accounts he managed. Establish a position sizing model and adhere to it, regardless of how confident you are in the trade. Mark Douglas’ Trading In The Zone is a classic book that walks you through the mindset shifts of a successful trader. Being at peace with any outcome is critical for responding correctly to the constant market flux. Also, think beyond the risk of losing money. To some traders, every trade they take places their ego at risk. For them, every losing trade is a dent on their self-worth. Accepting this aspect of trading as well to avoid undesirable responses to losing trades. After each trade, immediately ask yourself if you’re at peace. If you’re not, you have not genuinely accepted all the risks. Dig deeper to find out why. Is it because you are under-capitalized? Is it because you fail to appreciate market uncertainty? Or is it because you deviated from your plan? Richard Dennis’ words highlight the risk of missing out on good trades. The markets are generally efficient. This means that the best trades (that allow you to can make a lot in a very short period) are rare. The cost of missing these spectacular trading opportunities is high. Hence, you need to make sure that you can take advantage of them when they present themselves. For this, you must preserve your trading capital. Limit losses on trades that are not working out using stop-losses. Consider time-based stops to ensure that your capital is not locked up in the market for no good reason. Jesse Livermore recognized that traders often overestimate their abilities to handle their emotions. I’ve experienced it firsthand. In my first few years of trading, I refused to admit that my emotions can get out of hand at times when I trade. It’s only when I faced my human side and took steps to deal with the destructive feelings that I became a more consistent trader. Have a plan in place to deal with flaring emotions. Don’t react blindly to fear and greed. Get some ideas here. Losing perspective is a risk to every trader. It brings about confusion. Without perspective, you cannot trade well regardless of your trading strategy. Moreover, it is an insidious risk because a trader who has lost perspective is often unaware of it. Limit the hours or sessions you trade so that you focus on quality and not quantity. Still unconvinced of the importance of risk management? I hope the words of a Market Wizard like Larry Hite will help to convey the message. Take a hard look at risk. Go through your entire trading process. At every step, ask yourself: what could go wrong? Try your best to mitigate or manage the identified risk. Try your best to act on the pieces of advice above, and you will be far ahead of the pack when it comes to risk management. Nonetheless, remember that the aim is not to eliminate all risks. Trading is the art of risk-taking. The focus is to take the rewarding risks and contain the punitive ones. Want to understand the context of some of the quotes above? Wish to pick up more practical tips from top traders? Please, enroll me on your training program about trading. I want to learn much about risk management since I am beginner in terms of forex trading. Hi Stephen, it’s great that you want to focus on risk management as a beginner. This is definitely a good start. Please look at this page for more information on my trading course. It does not cover risk management exclusively, but it does go through a framework on risk management as part of the complete trading approach.